HONG KONG, May 17, 2017 - (ACN Newswire) - A one-stop platform for new businesses to find funding and support services, the HKTDC Entrepreneur Day will return this week with informative forums, practical pitching sessions and networking events for start-ups. 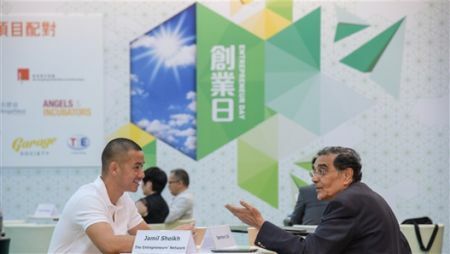 Taking place on 19-20 May at the Hong Kong Convention and Exhibition Centre, the event is one of the more than 330 trade fairs and promotional activities organised each year by the Hong Kong Trade Development Council (HKTDC), a statutory body dedicated to creating opportunities for Hong Kong's businesses. More than 270 exhibitors have signed up for the ninth edition of Entrepreneur Day, the largest participation so far at the event which will focus on three critical factors - creativity, capital and connections - to help start-ups get their businesses up and running. Among the key aims of Entrepreneur Day is connecting fledgling entrepreneurs with investors. Lack of funding or difficulty finding financial backing is one of the biggest hurdles that start-ups must overcome. A recent survey conducted by the HKTDC revealed that 69 per cent of respondents believe access to capital is a major obstacle, particularly at the prototype and testing stage. When start-ups reach the expansion stage, it is still difficult for them to find the financial support they need: 58 per cent of companies surveyed said obtaining adequate access to capital is the biggest challenge they face. Start-ups will also get the opportunity to meet representatives from angel funds and venture capitalists, including Carman Chan, Managing Partner of Click Ventures Limited, which has previously invested in globally recognised brands including digital music service Spotify and online social networking portal Meetup. Other high-profile investors at Entrepreneur Day include Veronika Kuznetsova, Managing Director of SuperCharger Fintech Accelerator, a 12-week accelerator programme for fintech companies. Another highlight of the two-day event is the Pitchathon, involving organisations including StartHub, Hong Kong Startup Council and Cocoon. Pitchathon is designed to help start-ups pursue incubator support and hone their fundraising skills. Starthub 3.0 Pitching Competition has previously attracted more than 100 startup projects and investment institutions to Hong Kong and Chinese mainland at its two previous events. The Angels Investment Foundation will allocate HK$20 million to the winning investment value projects of the competition. Another seminar, "Start-up Atlas - Crowdfunding Your Start-ups", will provide practical tips on getting a crowdfunding campaign up and running from those in the know, including Florian Simmendinger, CEO & Co-Founder of Soundbrenner Limited, the world's first wearable for musicians, who raised more than US$230,000 for his vibrating metronome on Indiegogo. Recognising that start-ups struggle to raise funding, Entrepreneur Day will feature exhibitors from several prominent funding schemes and start-up support programmes. These include Cyberport, which offers an Incubation Programme and Accelerator Support Programme; the Hong Kong Design Centre, which has a Design Incubation Programme; and the Trade and Industry Department which offers an SME Loan Guarantee Scheme and SME Development Fund alongside other programmes. New businesses will also be able to meet potential investors and mentors at the Start-up Mixer. Co-organised by the HKTDC and the Hong Kong Federation of Youth Groups, this networking event is similar to a speed dating session and provides a valuable opportunity for start-ups to meet mentors and investors that can see the potential of their businesses. The Startup Weekend Hong Kong Bootcamp, meanwhile, enables participants to experience the highs and lows of start-up lifespan over an enlightening afternoon session. The four-hour event is designed to provide experiential education for start-ups and provide them with opportunity to meet with potential mentors, investors and partners. Entrepreneur Day will additionally feature a host of inspirational and informative talks as part of the Start-up Runway forum, including "Trend Projector - Innovative Travellers: The Next Lucrative Market", where successful travel start-ups will discuss upcoming trends in their industry. More, renowned elites including Simon Loong, Chief Executive Officer and Co-Founder of WeLab, ranked among of the top 100 Fintech companies in the world; and Terence Kwok, Co-Founder and CEO of Tink Labs Limited, who recently completed a US$125 million round of series C financing, will share their insights during the Show. Entrepreneur Day will feature a dedicated exhibition zone, The Imaginarium, which will bring together more than 50 start-ups to showcase innovative products and technologies in fields such as health technology and biotechnology, fintech, greentech, the IoT (Internet of Things), artificial and augmented reality (AR/VR), artificial intelligence (AI) and robotics. Another exhibition zone, The Cosmopolitan, will feature start-up projects from overseas and the Chinese mainland.